Double domed nickel plated brass rivet with 7mm cap diameter and 9mm stem. Matching hammer tool is NoG23E. 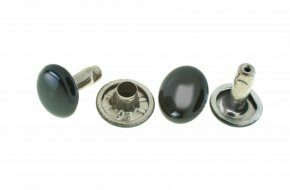 Double domed nickel plated steel rivet with 8mm cap diameter and 8mm stem. Matching hammer tool is NoG23E. Double domed electro brassed steel rivet with 8mm cap diameter and 8mm stem. Matching hammer tool is NoG23E. Double domed black enamel steel rivet with 8mm cap diameter and 8mm stem. Matching hammer tool is NoG23E. Double domed nickel plated brass rivet with 9mm cap diameter and 7mm stem. Matching hammer tool is NoG23C. Double domed nickel plated steel rivet with 9mm cap diameter and 8mm stem. Matching hammer tool is NoG23C. Double domed electro brassed steel rivet with 9mm cap diameter and 8mm stem. Matching hammer tool is NoG23C. Double domed nickel plated brass rivet with 9mm cap diameter and 9mm stem. Matching hammer tool is NoG23C. 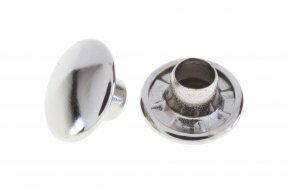 Double domed nickel plated brass rivet with 10mm cap diameter and 10mm stem. Matching hammer tool is NoG23C. 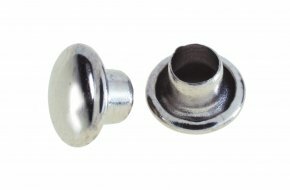 Double domed electro brassed steel rivet with 10mm cap diameter and 10mm stem. Matching hammer tool is NoG23C. Double domed black enamel steel rivet with 10mm cap diameter and 10mm stem. Matching hammer tool is NoG23C. Double domed nickel plated brass cap only only with 10.5mm diameter. Double domed nickel plated brass rivet with 12mm cap diameter and 12mm stem. 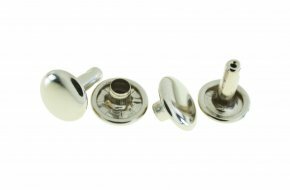 Double domed nickel plated steel rivet with 12mm cap diameter and 15mm stem. Matching hammer tool is NoG23B.